but I cannot read them. Over the years, I have translated a number of groups of graves and complete cemeteries, both for my own projects - Hevron and Rozdol, for instance - and for others. In my own family research, I have presented graves in two ways. 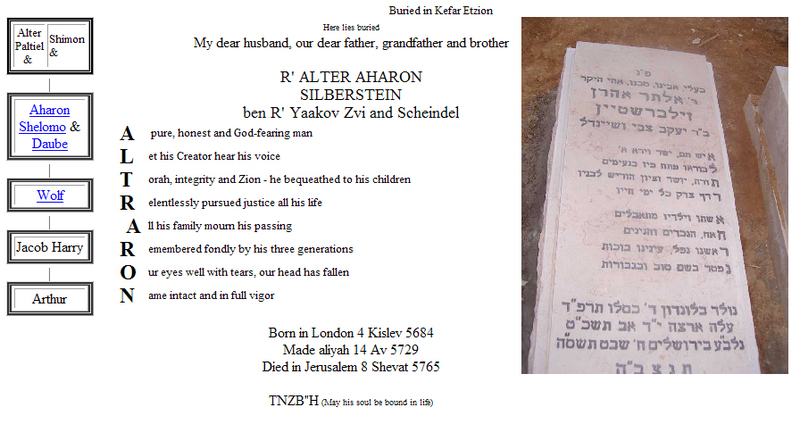 The Pikholz Project includes over four hundred grave photos and translations, indexed by cemetery and by date of death. For some of my other families - the Zylberstajn family, for instance - deceased members are listed by generation, with links to many of the family graves. But at the core of these memorials are the grave photos and translations themselves. This one, for example. To discuss how I can help you translate gravestones or set up a virtual cemetery, contact Israel Pickholtz, Solutions.